Review: "Horna: Sotahuuto" - Sea of Tranquility - The Web Destination for Progressive Music! 2007 was a certainly a busy year for Horna, the Black Metal cult band from Finland. They issued a few split releases on Moribund Records as well as the absolutely vicious sounding full length disc ��ni� Y�ss� earlier in the year. 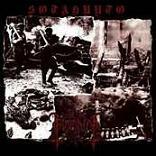 However unlike ��ni� Y�ss�, which wasn't really a Horna album proper (performed solely by guitarist Shatraug and vocalist Corvus), not to mention it was both more conceptual and experimental, this slab of straight ahead raw black metal entitled Sotahuuto (which was actually recorded in 2004, with both Corvus and Shatraug being joined by Lord Sargofagian on drums) is more in keeping with the bands past work. Sotahuuto is Horna's throwback tribute to the early years of the genre, and in particular the innovators of black metal, Bathory (recorded the same year of Bathory founder Quarthon's death). The nine songs laid down here perfectly capture the old school vibe of the abrasive sounding early days of black metal. Each track explodes out of the gate with a remarkable amount of lo-fi, punk infused reckless abandon. The riffs seem to get dirtier and uglier with each song as Corvus gargles out the venomous black filth in his native tongue. You don't care so much what he's saying, it just sounds evil and that's what matters most. Shatraug delivers an absolutely huge wall of sound with his utltra violent and super heavy guitar work while Lord Sargofagian delivers on his end as well, pounding his drums into submission. While Sotahuuto does clocks in a little short at slightly just over half an hour, the fact is Horna could easily wipe the floor with the majority of their contemporaries with the amount of damage they inflict here. If you haven't done so already, get on board now before Horna quickly emerges from their underground status.